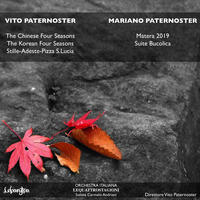 Vito Paternoster : The Chinese Four Seasons and the Korean Four Seasons. In 2005, the great Italian composer Francesco D'Avalos, in his book "La Crisi dell'Occidente e la presenza della Storia" (The meaning of the Twentieth century through the evolution of music - edited by the Bietti publishing house) remembers his favorite pupil: "Vito Paternoster wrote beautiful music of a rare originality. I remember Inzaffirìo and The Bread.... he had such a deep knowledge of traditional harmony that he could use it in all its expressive potentialities whilst still respecting its strictest rules." The language that he possessed in all its potential becomes a game of manipulation, overlapping and connecting distant references, alluding to ancient times, distant places and leading to a joyful nostalgia. It is not a rejection of the present, but an attempt to overcome it. His musical language draws equally from elements of Vivaldi to Jazz styles, from Bach to Pop music, from Strauss to Folk music. The strong coupling of national popular melodies however is very far from its nineteenth-century practice aimed to create and improve national identities for the early Nation States. On the contrary: the idea of national culture, and everything that is related with localisms, is removed from its original function becoming, with a slight irony, a pretext to create some elegant music language games. The popular themes are adapted to trans-national and universal contexts, and the local musical colors are confined to the realm of memory, of a glorious but mythical past, distant in time and space. It is a way to enrich the present with some hope. Full liner notes are available for download to members. License Cellist extraordinaire by Vito Paternoster for your project. Play the music of Vito Paternoster in your restaurant or store.